Enota students and siblings: Catie Rell Oliver (L) and Tug Oliver. Meet the new Enota MI Academy! On Aug. 8, the NEW Enota MI Academy opened it’s doors (saved from the original Enota building!) for its first day of school, welcoming students, teachers and families, alike. 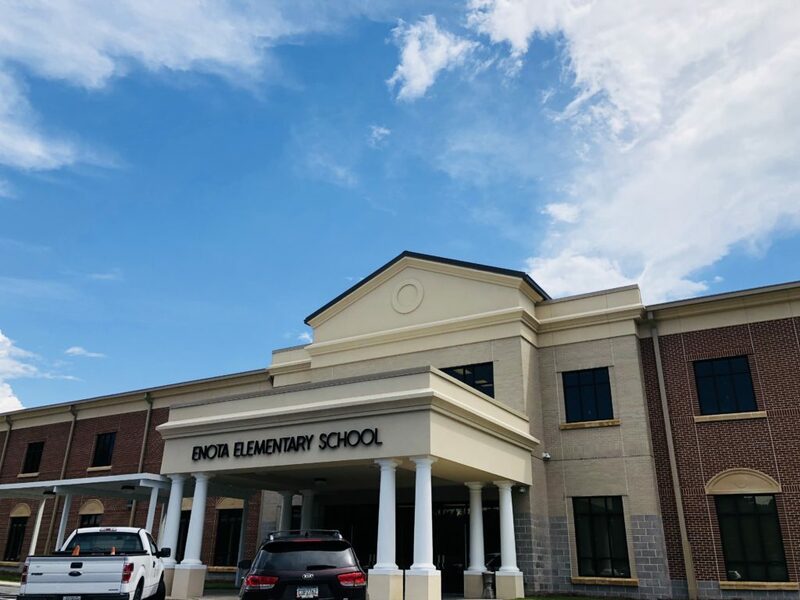 Enota is just the latest of Gainesville City Schools to get a makeover and we have to say it is GORGEOUS and Enota students are a pretty lucky bunch! According to The Times, the Enota MI Academy, constructed by Carroll Daniel Construction, was a 12 month project. The original Enota building had been educating Gainesville children for six decades. The new school was a $19M project and 129,000 square feet. We thought Enota, full of Gainesville tradition, was perfect for a Faces of Hall County feature! Imagine this beautiful building telling the store of her history and legacy in our community…please have fun reading her story below! Question: How long have you lived or worked in Hall County? Enota kindergarteners Bryson (L) and Mak Kerr. Q: Tell us about keeping the original front doors from the former Enota MI Academy? Q: What is your favorite restaurant in Hall County? Q: What is the biggest change you have seen over the years? Q: What has not changed with the new building? Q: How big is the building? Enota MI Academy in Gainesville, Ga.
Q: What is your favorite part of this change? Q: What three words mean HOME to you? Abernathy Cochran Realtor Robert Bell contributed to this feature.